I love it when a dish just makes sense somehow. Feels more efficient. This can often be achieved by using two parts of the same plant, or animal, if in unsuspecting ways. Hey, if eating meat from head to tail is all the rage, then how about vegetables from shoot to root? Stalk to flower? Waste not, want not, and why not cook ’em both together? 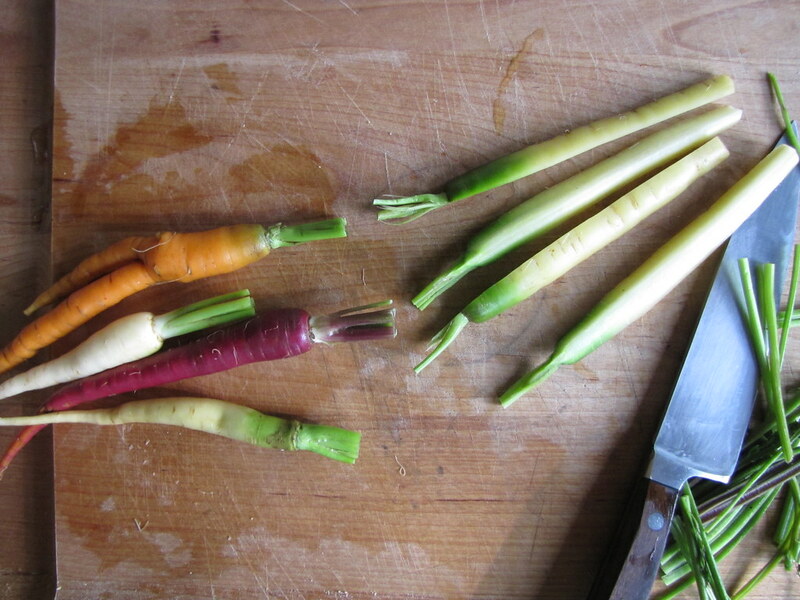 That’s what I thought when I bought a bunch of these lovely tri-colored carrots. Though prepared this way, you might not even guess it was all the same plant. I was in Putnam County, New York last week, on the border of Vermont, and hit up some farmers’ markets in the area. It seemed to be spring still up north a little way’s: sugarsnap peas and leafy greens littered the stalls, while the former have come and gone in these parts and peaches and corn have been here for weeks. 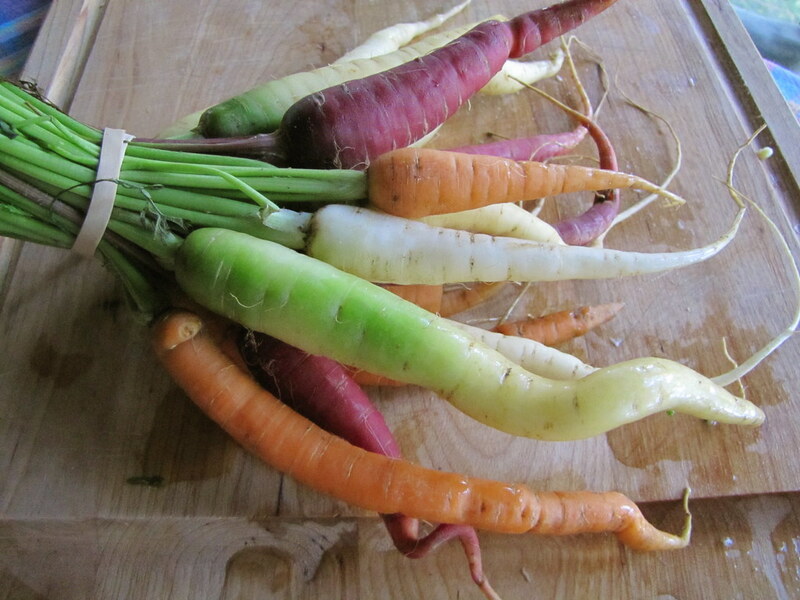 But at one table, I spotted this bunch of colorful carrots, from a farm that clearly took pride in their heirloom array. I left with some purple broccoli and an oversized, off-white pattypan squash along the way, as I snagged the last bunch of their carrots for the day. Most of the carrots were about the width of a Sharpie pen, with long, sinewy tapers. I thought they’d be great for slitting in half lengthwise and grilling. 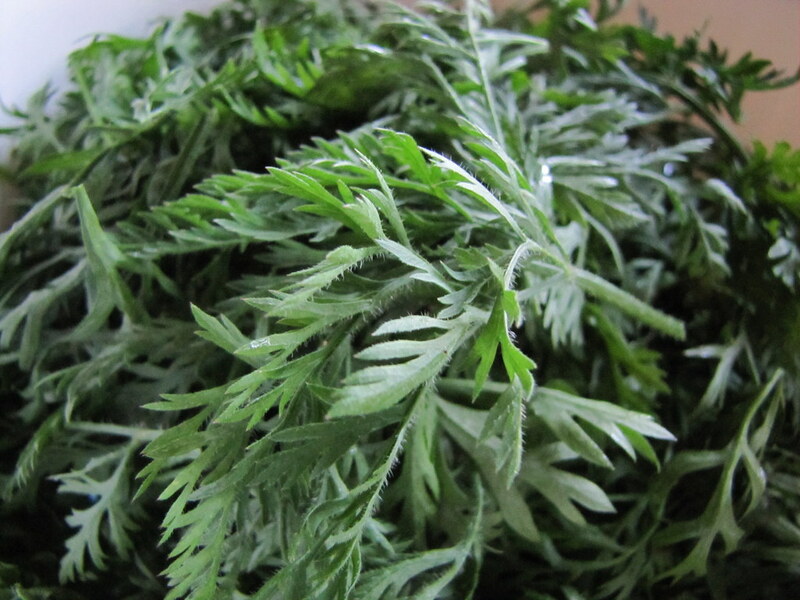 But they also came with a full head of feathery, frond-like greens. Carrot greens may not be the most desirable leafy green to eat, but they’re a real superfood, dense with Vitamin A just like its roots as well as tons of K and C. There was simply too much good stuff to just lose. I’ve made “pesto” with fresh kale before, and other unlikely leafy greens. So the deep-green carrot tops didn’t seem too much of a stretch. Because these leaves are fairly tough and stringy, I blanched them first in salted water, and tried to remove any long pieces of stem. Even though they boiled for about a minute, so much bright green seeped into the water, a sign of their potency. I also made the most bare-boned version of pesto, with just salt, pepper, olive oil and a raw clove of garlic — no nuts and no grated cheese this time (although those ingredients are listed as optional below). Carrot greens have an exceptionally sweet, grassy taste, and it certainly comes out in this pesto. When slathered on something else, you might assume it’s just basil pesto at first bite, but the unique flavor will creep up on you pretty soon. I like leaving a little stub of the (edible) stem on the carrot while snipping the rest off. These can be used as a handle while you crunch away at the rest of the root, even more convenient when there’s a sauce to dip it in like this pesto. That’s how it was handled when I served them to a friend, though I ended up eating his leftover stubs (maybe just for that efficiency, waste-not logic). If you can still find really fresh carrots at this time, here’s a real fun way to cook them. Oh, and the pesto can be used for hoards of other dishes once the carrots are gone, too. I made about a pint in total from the greens of just one bunch. Three brownie points: We know that carrots are good for eyesight from all their Vitamin A, but they’re also very high in fiber, and low in calories. The latter was especially surprising given how sweet they taste, and certainly become once caramelized a little to bring out their sugars (it smelled a lot like roasting marshmallows while grilling them). 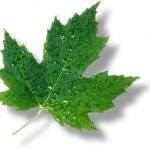 The greens have Vitamin K which is lacking in the roots. Eat it all up, I say, and since it’s so flavor-packed, no need to go heavy on the accoutrements. 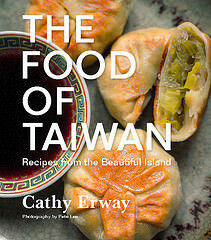 I like the economy of this recipe! 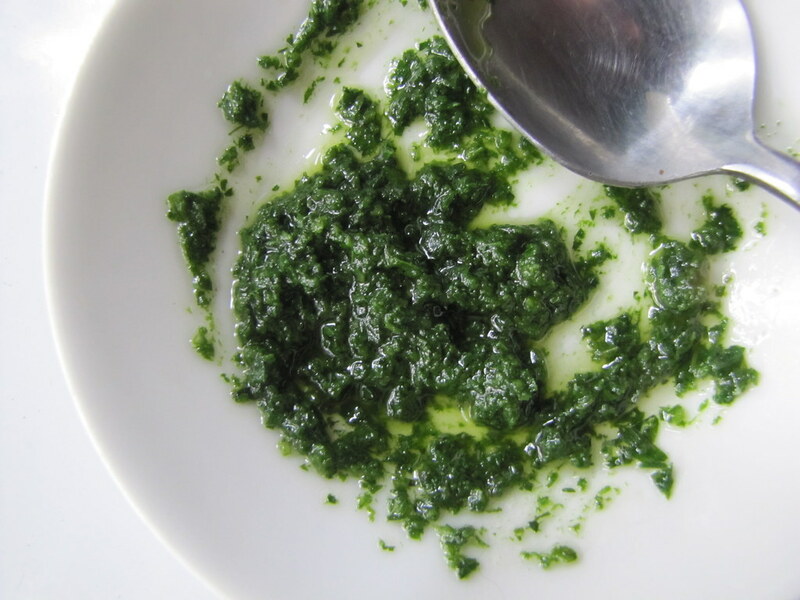 How did the carrot greens pesto end up tasting? Was the texture rougher than a basil pesto? Good question! I just added some more on that, but no, it wasn’t tougher than basil pesto but I had to blanch the leaves first to achieve that! Great idea, the less waste, the better. Inexpensive too. Looks wonderful. I can’t wait to try it! Wait a minute…..you can eat carrot greens? I had no idea! 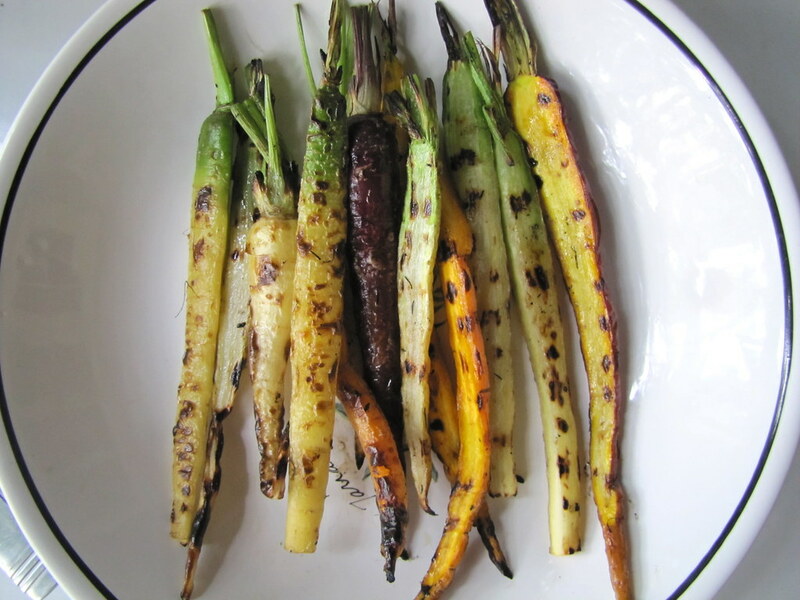 I have never grilled carrots… why? I have no idea. They look wonderful. And I love that you used the greens too! Fabulous idea! I’m never sure what to do with the beautiful carrot greens that come in our CSA share. Thanks for the idea! oh this looks so good! and I love your tip for “grilling” for the city-dwellers without outdoor space for a real grill! Curious though, just where in Putnam County is there a border with Vermont? I think you mean Connecticut. Hallelujah! I’ve been hoping for a way to not waste those tops. I love this! Once I learned you can make pesto out of just about anything, I started experimenting like mad, and find that carrot pesto does indeed go best with… carrots. Similarly, I love how roasted beets pair so well with their garlicky-sauteed greens. Knowing now (as I didn’t when I was younger) that just about every part of the plant can be used in any number of ways, I find it increasingly difficult to deal with the realization that there is so much waste out there. That said, I love the fact that you are so economical in this sense and that your recipes help people think about their food in new ways that maybe they hadn’t considered (as evidenced by the comments above). 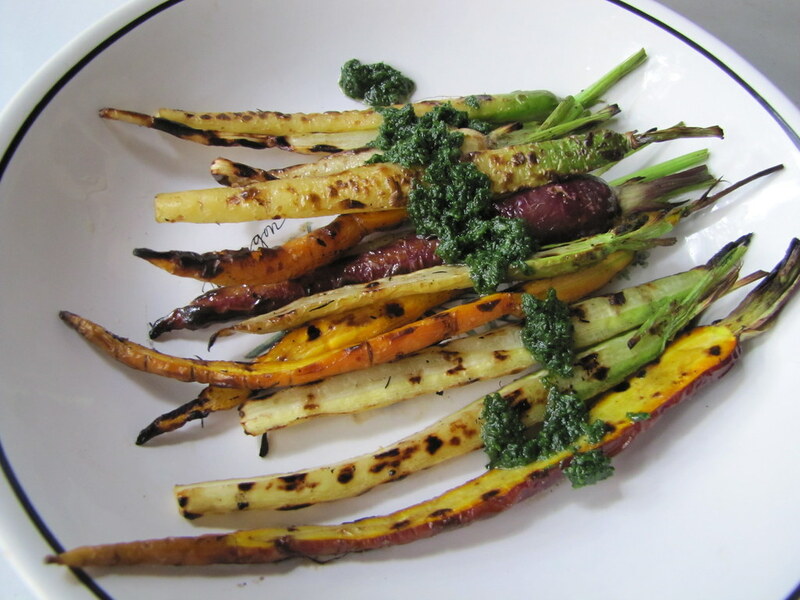 What a wonderful tip – I’ve never used carrot greens before, and those carrots look so beautiful grilled! From what I hear Carrot Greens are a neurotoxin- Probably only if you eat too much but be careful what you eat! We have been making carrot green pesto all fall, and are loving it! Basil doesn’t grow so well in Newfoundland, but we’ve been getting bunches of carrot tops from our farmers market (for free!) to make carrot pesto. It’s great not just on carrots, we use it like regular pesto. yum! Well, up to now, I have just been putting my carrot greens in the compost…I’m sure all those nutrients made the compost superb…but now I’m going to try eating them. I had previously thought that they might be too bitter. I grew these carrots this year, this is a perfect way to use use those fresh tops..a little of the pesto in a dill roasted potatoe and carrot salad picks up the flavors well. Hi! Just made this right now and wow what a surprise! The pesto was delicious, although I ended up using a lot less olive oil, but that’s because I like my pesto extra thick and chunky 😀 I wasn’t sure how the pesto would taste with the carrots though, but I grilled them up and they went PERFECTLY together. This recipe/idea/you are BRILLIANT! Tried the carrot top pesto and it is delicious! I used cashews and parmesan and it was great. What a great idea to use all the greens from the garden. I tried the carrot green pesto on spaghetti, with parmesan sprinkled on top, at a recent dinner for house guests. You can’t imagine the reaction! Everyone loved it, even one person who did not like Pesto made with Basil. They asked for a repeat before they were to leave! PS. I used the greens, garlic and olive oil only to make it. Thank you so much, keeping the vegan teenagers happy. I tried it and it is tasty and beautiful. I needed to add cheese to the pesto, but otherwise… a perfect veggie. My 6 year old son even liked it.